Wishing all of you a very happy, healthy, successful and awakened 2013. I would like to thank everyone for all their love and support in 2012 which has helped Mastery of Meditation and Yoga become one of the biggest yoga websites on the internet. I have a some great plans for 2013, which include more online classes, yoga and meditation videos, mantra and music mp3s and even live webcasts and workshops, all for free of course :-). To kick off the new year I would like to publish for you the very important yoga for flexibility routine. The full set can be found in the article, Yoga for Meditation. I provided this set in a newsletter a few months ago, but wanted to publish it on the website as well so everyone can have access to it. This workout is excellent for developing lower body flexibility and contains some key yoga poses to help stretch and open up this region. Many of these exercises are difficult to explain, so the illustrations below should be very useful to you. For those interested in meditation, this routine is especially useful as the poses improve the flexibility of those regions which tend to give trouble when one is sitting for meditation. So if you are finding meditation uncomfortable, I strongly suggest doing these poses prior to sitting and in a few months you will notice a remarkable improvement in your flexibility and consequentially sitting will be much easier. Also, for those students enrolled in the yoga teachers training or meditation certification program, this set is a must. For yoga teachers this is a great routine to do when starting your class to warm-up and prepare the body for more advanced poses and as explained above, for sitting in meditation, this is one of the best sets you can practice. Recently I have also been adding these poses individually to the website, and so you can click the title to read the full article on that particular pose. This is the most basic and effective pose for those looking to improve their flexibility for meditation. It is also an ideal pose with which to begin your yoga session. Done with Powerful Breath of Fire, it can get you energized as well. Recently I also created a video for this pose and you will find it here – Yoga Helps Meditation Video – Butterfly Pose. 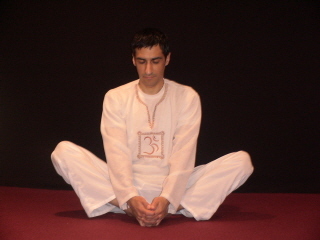 To practice this pose come into the position as shown by the illustration below and hold for 1-3 minutes. More details in the article and video. For the long time readers of the website and the fans of the Free Silent Mind Advanced Meditation Program, I know these illustrations are long overdue :-). Cradle rock is excellent for opening up the hips and for helping you sit cross legged better, but it is a difficult exercise to describe without illustrations. Thankfully I was able to get my wife Trupti, also a fellow yoga teacher, to demo the exercise recently and below are illustrations on how it is done. To practice this pose rock each leg as shown for 1-2 minutes. By rocking I mean to bring the ankle towards the chin and then back to the starting position. For more details about this exercise, please visit the set I have linked to above, it is exercise #13 in that set. Cow pose is a great pose for improving the flexibility of your hips. Below is a picture of modified Cow Pose, which is a pose you can come into for 1-2 minutes. If you are unable to do this pose, then substitute it with Yoga Knee Bounce instead. To do Yoga Knee Bounce, sit with up with your legs extended in front of you. Then bend your left leg and place your left ankle high up on your right knee. Hold onto your left knee with both hands and bounce the knee gently up and down. Do for 1-3 minutes, and then repeat with the other leg. Be sure you don’t force this exercise or force yourself into Cow Pose below. This is another exercise from the Yoga for Meditation Set (Exercise #8), which really needs to be illustrated for clarity sake. Again, for this pose I will publish a detailed article soon with some variations, but below are instructions and illustrations on how to do this great stretching pose. To do Frog Pose lie on your back and bring both legs up into the air with the soles of the feet pointing up towards the sky. Reach up with your arms and hold onto your feet and pull your knees down towards your armpits. The legs should be spread wide, creating a stretch in the groin area. You should be holding your feet from the the inside such that the back of your hands are facing each other and your fingers are curled around the arches of your feet. You can see from the explanation above, why illustrations would be helpful for this pose :-). Hold the pose for 1-3 minutes, and do either long deep breathing or Breath of Fire. Along with tight hips, groin and knees, another common issue when sitting for long periods of meditation, is having lower back pain. So it is a good idea to stretch out the back as well prior to meditating, so you can sit steadily and silently for extended periods without discomfort. Here is a simple back stretching exercise which will help you accomplish this. Just follow the illustrations below and stretch each side for 1-3 minutes. This set will become part of the Free Online Yoga Sets collection here on Mastery of Meditation and Yoga, and you can visit that collection to find more great yoga routines to help you develop your lower body flexibility. Which meditation will help to stay healthy physically and mentaly ?I feel stressed in both way,and lose my temper always.Can’t face any problem.